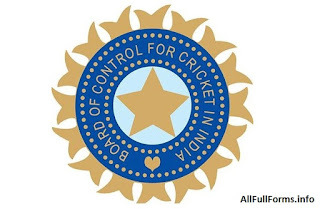 International Cricket council (ICC) is affiliation and Asian Cricket Council is regional affiliation of BCCI. Head quarter of board is placed at Wankhede Stadium, Mumbai, Maharashtra, India. President of BCCI is Anurag Thakur (As of April, 2018) and Vice president is Somnath Dhar. Ravi Shastri is men’s coach and Tushar Arothe is women’s coach in BCCI. Income of BCCI is INR 1,714 /- crore. R.E. Grant Govan was the first president and Anthony De Mello was the first secretory of Board of Control for Cricket in India (BCCI). BCCI has 5 cricket zones. Below are 5 cricket zones of BCCI. BCCI Full Form from various categories like, Banking, Commerce, cricket, business and many more are as under. BBCI का फुल फॉर्म (Full Form) “बोर्ड ऑफ़ कण्ट्रोल फॉर क्रिकेट इन इंडिया” है. BBCI की स्थापना दिसम्बर, १९२८ में हुई थी. BBCI का हेडक्वार्टर वानखेड़े स्टेडियम, मुंबई, महाराष्ट्र, इंडिया में आया हुआ है.